Topics: Meetings, Science, Audits, Publications, and Education. Age: The domain is 19 years and 11 months old. The site has about 96 users daily, viewing on average 1.20 pages each. 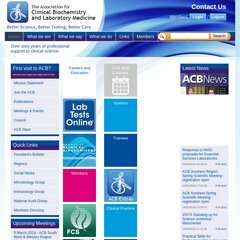 acbsww.org.uk 25-hydroxy vitamin-D (25-OHD) Assays; The state we&apos;re in…. The programming language environment is PleskWin. It has 2 DNS records, ns1.namecity.com, and ns2.namecity.com. It is hosted by Easyspace Dedicated Servers (Scotland, Glasgow,) using Microsoft-IIS/6 web server. PING www. (62.233.103.75) 56(84) bytes of data. A ping speed test response, is timed at 117 ms.